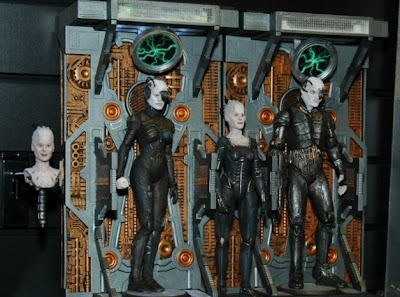 First up some new Borg seven inch action figures. The wave will consist of the Borg Queen (with accessory head and mechanical spine), Borg drone Seven of Nine and a generic male humanoid drone. Each will come with parts to build a Borg alcove and will apparently be a little pricier than the figures normally are due to the intricate detailing on them. They'll be out later this year. In their second wave of Deep Space Nine figures the core assortment will be Bashir, O'Brien and Martok, with a Kira (in Starfleet uniform) and a two pack consisting of Worf and Gowron. Out early 2009. 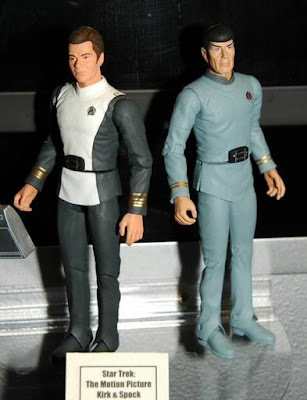 And finally from the seven inch scale range, The Motion Picture era Kirk and Spock figures, coming in the autumn. 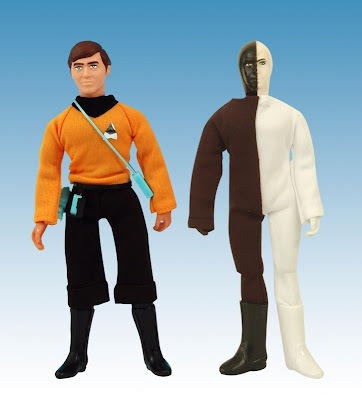 At a larger scale the Mego retro cloth figures will continue with a newly sculpted Chekov and re-release of the classic Charon figure, with further plans for more new figures, possibly including a Gorn. Back at a smaller scale the Minimates line continues and expands greatly with new figure two-packs from all over the franchise. Wave four will consist of Captain Picard and a Borg, sickbay Dr McCoy and Nurse Chapel, The Wrath of Kahn Admiral Kirk and Scotty and The Wrath of Kahn Admiral Kirk and engineering Scotty. Followed by wave five, consisting of; The Trouble With Tribbles Kirk and Rand, Decker and Ilia, Gul Dukat and Commander Sisko and Gul Dukat and Captain Sisko. Continuing their line of starship models August will see an Enterprise-D model, with plans for an All Good Things... tri-nacelled version. In props there are plans for a TOS tricorder and Wrath of Kahn phaser, out late this year or early next year. 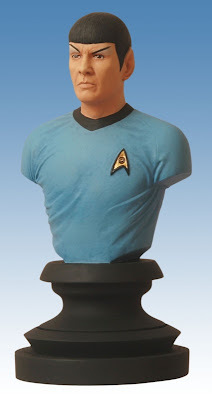 And finally the Star Trek: Icons bust line will continue to expand with a TOS era Spock bust. For more on these products see TrekMovie.com's report from the toyfair, and these galleries (here and here) which have lots of pictures of new items and a few previously announced toys.